My name is Valerie Epstein-Johnson and I am an art therapist and mental health counselor with a private practice at Home Collective, a holistic wellness center in Wheat Ridge, Colorado. To me, any complete approach to wellness includes creativity and depth, so you might also describe me as your Self-spelunking partner—a guide and companion who helps you navigate your own depths using conversation, pen and paper, paint, and sand as your equipment, in order to help you craft the life you want, while enduring and perhaps changing the stuff you could do without. From my very first contact with you I want you to feel welcome—with me and in my therapy space. I have taken great care to create a cozy, healing place that doesn't feel like an office; the vibe is “artsy mid-century living room” rather than “business office” or "institutional." In my opinion, a stimulating but comfortable relationship and environment are the foundations of any good therapy experience. 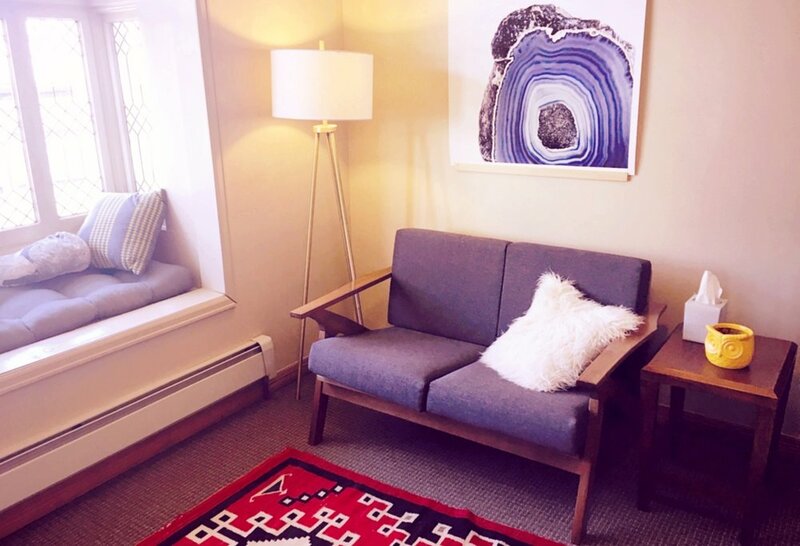 From the sunny waiting area with tea and a rack to leave your shoes if you wish, to my leaded glass window seat and art-making nook, Focal Point Art Therapy + Counseling and Home Collective are designed to make you feel welcome and at ease. I meet you where you are while I stay true to me. Unlike many traditional health care providers, I do not assume a clinical persona or keep my personality out of my work. I am laidback, down-to-earth, and I am not afraid to use my “funny because it’s true” sense of humor in my work. As an intermodal art therapist trained to use the full range of expressive arts media in therapy, including movement, art, and music, I often move around and use the space to maximize the therapeutic possibilities of a session. In a therapy session with me, that might mean moving the furniture and making art on the floor or taking a “mindfulness walk” outside in the backyard at Home Collective. Though you may use your insurance to see me, Aetna or Humana doesn't make the rules; it's you and me in the room. I have always been a calm, sincere person with a love for the unique and the deep. Though I am, at heart, an introvert, I thrive on getting to know people and all their quirks. In fact, I do my best clinical work when I can use all of what makes you you, even things that might seem completely irrelevant to therapy. A session with me may find you discussing your favorite TV shows or making a seemingly absurd scene with tiny objects and figures in a sand tray. Prescriptions and protocols alone may work for diseases, not complex, irrational people like you and me. If we don’t shine a light on what makes you tick—what holds you back and what keeps you going—we are missing big parts of the map we need to help you start living your best life. I (try to) practice what I preach. My best life includes ample room for my work, family, friends, and me. Being a therapist is a non-negotiable part of my life, but so is being a hands-on mom who is around for my 2 young daughters during day-time hours, so I have been privileged enough to choose to work outside my home only part-time. I make tending my relationships and my own self-care priorities; these are the focal points of my life. What are yours? In therapy with me, you will clarify and affirm them and strategize ways to make more room for them in your life. In addition to working with clients, my self-care includes spending time with my family and friends, singing in a Denver women's choir, making art and writing poetry, burning calories and stress, (and discovering my inner Latin dance diva), with Zumba, enjoying the out-of-doors, reading, watching liberal amounts of HBO, and doing yoga with the amazing teachers at hOMe Yoga Studio on-site at Home Collective. Unlike many therapists with practices in the burgeoning Denver counseling community, I am not fresh out of school or new to adulthood; I am a seasoned therapist and a woman transitioning into middle age. Now that I am in my 40’s, I feel myself evolving into a mature adult with the courage and wisdom to embrace what fuels me in spite of old doubts and insecurities that never quite go away. If I have any creed to share it is: We can live our values and grow into who we want to be, in spite of and because of our vulnerabilities. Once the shock of The Big 4-0 wore off, (a year or so after the fact), it began to dawn on me that I now possess a fairly wide range of life experience and corresponding levels of empathy and insight, which make me a better therapist. In this middle chapter of adulthood, I am finding a new acceptance of my imperfections and the often-circuitous path Life takes. That acceptance is reflected in how I work with clients. In graduate school, we were encouraged to “trust the process”—the creative process, the therapeutic process, and the individual’s Life process. When I graduated more than a decade ago I was inspired by that idea but did not fully grasp how to put it into practice. Today, I trust in process because I’ve navigated painful periods in my own life and feel stronger and wiser for having lived them as chapters in my life story. I've worked with clients as they've slogged through their own difficult life chapters and work in therapy with bravery, and I've seen them come out more whole and confident on the other side. It is truly rewarding to be a therapist at this time in my life; I have the personal experience to listen from a place of authentic understanding and the professional competence use the skills I've learned over 20 years in social services to help you meet your therapeutic goals. If you are ready to embark on a journey of self-discovery and healing with me, learning about what you need to live your best life and how to get it, contact me or call 720-336-5852 for your free, 30 minute consultation. I try to return all calls and emails within one business day.